Blog | Jon Baas: "A Million Dollar Trade"
Jon Baas: The Brand Man. -- Build Your New Brand Starting at $5! Two weeks ago, I started a new social project. I decided to pursue a string of trades (with anyone who wishes to trade with me), and by doing so, trade-up to a small speaking role in a Hollywood movie or television show. I call it my "Trade Jon Baas to Hollywood" project. It's a bold, perhaps even crazy endeavor, but it's also one that could make for a great adventure story along the way. Who do I trade with? What do I trade for? Do I make it to Hollywood? That sort of thing. I'd love to see what happens, and anyone who trades up with me gets to be part of the journey. To start this string of trades, I originally offered an autographed stage script from one of my first stage performances. Back in 1996 (when I was still in high school), I played the role of Gandalf in a stage dramatization of J.R.R. 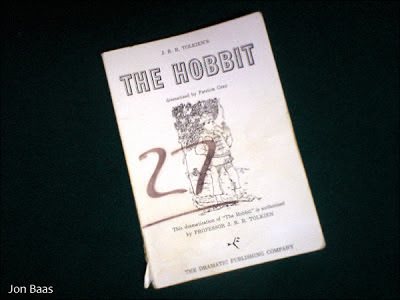 Tolkien's "The Hobbit". It was a fun opportunity, and it helped set me on the path to being the professional actor that I am today. Two weeks ago, that script seemed like an appropriate trade item to begin this project. In the first two weeks that I've been promoting this project, however, the thought has occurred to me that this might be a little too personal of an item to begin with. Perhaps something a little broader in scope would appeal to a bigger audience. Not everyone is as interested in trading for an old script. So I decided to make things a little more interesting; I'm going to start with another item instead. My first trade partner can still opt for the script if they want, but, moving forward, I'm going to promote the new item until the my first trade is completed. So, what is this new first trade item? Well, here's the thing: as a creative person, I have many interesting collections. One of the things I've started to collect lately is historic, real.... and fake currency. Believe it or not, there are actually artists out there who have taken it upon themselves to design their own unique paper money -- based upon current or past United States bill designs. Now, I should note, it is illegal to print money, copy existing currency bills, create real money as art, etc. You cannot recreate $1 bills, $5, $20, $100 bills -- any real denomination. That could land you in prison. As a result, artists will usually create their designs as "one million dollar bills", "fifty thousand dollar bills", and so forth. There has never been -- nor will there ever be -- American currency in those denominations. Therefore, it is NOT illegal to create a work of art that depicts this kind of fake currency, because there will never be one million dollar bills in circulation. 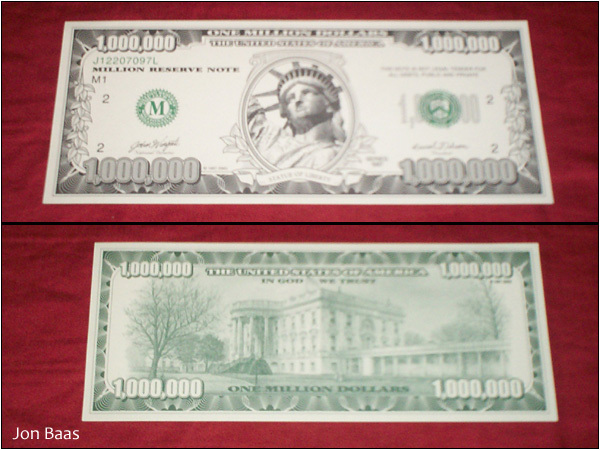 In fact, Hollywood uses this kind of fake money as props in all of their films, movies, and television episodes, because it is strictly regulated (and often impractical) to use real money in television/movie/film productions. So... any money seen in movies is fake, artificial.... not real. Since I'm starting this project with the hopes of trading up to an acting role in a Hollywood production, it seems appropriate that my new first trade item be a fake one million dollar bill. But not just any fake million dollar bill, no, this one looks really cool! It's from my own personal collection, and I will trade it to the first person who offers me a trade in my "Trade Jon Baas to Hollywood" trade-up project! And, to make this one million dollar bill even more unique to my trade-up project, if you want, I will gladly autograph it for you when we make our trade! Just keep in mind, this is NOT real money. You can't spend it. It's not worth one million dollars. But it IS unique, it looks "realistic", and it represents the kind of fake money used in Hollywood movies. Therefore, I think THIS is a better, broader item worth starting off my "Trade Jon Baas to Hollywood" project. So.... would YOU like to trade with me? Check out my "Trade Jon Baas to Hollywood" blog post to learn more! I'm still looking for my first trade. Only now.... I'll trade you "a million dollars"! Copyright © 2017 Jon Baas. All rights reserved. Powered by Blogger.